Used for a variety of Reformer exercises, the Side Split platform allows for precise alignment, and a wider footprint, thus increasing stability. It’s removable and easily stored under the reformer or stored with other Reformer props. Used for a variety of Reformer exercises, the Side Split platform allows for precise alignment, and a wider footprint, thus increasing stability. It’s removable and easily stored under the reformer or stored with other Reformer props. 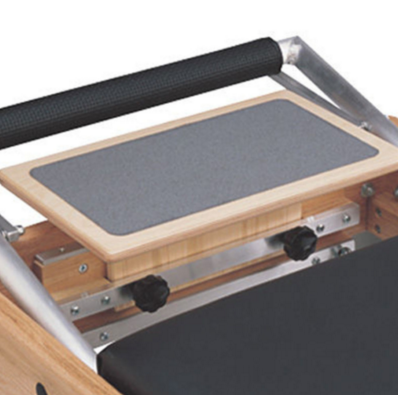 Fits wood studio line Reformers only Non-slip finish on top for stability and grip You have paid for a delivery service only. This means that the courier will only deliver your item to your front door or the nearest accessible point on the ground floor – If you wish to have your item taken inside and installed please contact us immediately and we can give you a quote. 01733 205551 EXT 2 The courier company will call you to arrange delivery. Lead time is between 2-3 weeks.